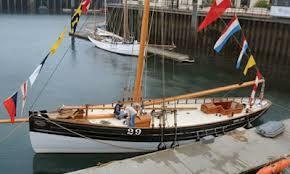 Originally launched in 1911, Kindly Light represented the final evolution of the pure sailing pilot cutter and was considered to be the fastest and most successful pilot cutters around, and she made her owner Barry, pilot Lewis Alexander, a wealthy man. She continued working after the war, until in 1922 she was moved to Dorset and into private hands. Converted for ocean racing she served as a sailing training vessel until 1960 when she became the founding vessel of the Ocean Youth Club, and continued to take young boys and girls to sea. In 1971 she was sold to the Maritime Trust to become a museum exhibit at Cardiff Maritime Museum where she remained until 1993 when she was sold back into private ownership on the understanding that she would be restored. With such an historic vessel it was with great importance that her new owner, Malcolm McKeand, put her back exactly the way she was 100 years before. Meticulous research over many years was needed to piece together the detailed canvas to work towards, and her rig and fittings were no exception. The decision was made to go for a laminated solid construction with all the spars, and with the design in hand, the wood was sourced. Stones Marine Timber came up with the long lengths (33’ to 35’) of slow grown Columbian Pine with an average ring spacing of 22 rings per inch. With the mast section in excess of 10” in diameter, it was important to plan construction very carefully as glueing a too larger section together could, quite literally, pull the spar apart, should there be any timber movement. With the main mast made up of a total of 42 separate pieces of timber, the majority of which were in excess of 30’ in length, each bit had to be selected and allocated it’s position in the spar before scarfing or glueing could commence. Workshop manager, Chez Farrow, developed a unique marking and numbering system to ensure construction went smoothly, and despite the boom, gaff and sprit being constructed in conjunction with the mast, production went through the workshops flawlessly. The finishers set to work, squaring up before taking the corners off and then rounding out all the spars to the drawings. With a large surface area on the mast smooth, planing was done by two finishers working together, and when it came to sanding the spars through the different grits, every available body got involved. In the first week of August the spars were collected by Portacraft and shipped to Gweek Quay, into the hands of master shipwright David Walkie, to be united with Kindly Light. David and his team chased in all the fittings and dressed the spars ready for her to be slipped into the Helford River on a high spring tide and moved round to the Falmouth Maritime Museum for her official re-launch on 1st October. In a fantastic gathering of over 350 guests, under a beautiful clear sky, she was officially re-named by David Walkie’s daughter, and Malcolm McKeand was presented with the original coin removed from her mast step when she entered the Cardiff Maritime Museum, more than 35 years previously. She will remain on her mooring in Falmouth while the rest of her rig and sails are fitted, then cruised and enjoyed by her owner.